Because of other manufacturing delays, the 40- and 60- kilowatt-hour versions of the Tesla Model S will be delayed by 2 months, but in the grand scheme the company still intends to reach a 20,000 car/year manufacturing rate for 2013. Some Tesla Model S reservation holders will have to wait a little longer for their car to be built, due to other delays in Tesla Model S manufacturing. The company sent notices on Monday informing reservation holders of the delay, attributing it to the shifting of Tesla's "production ramp-up". 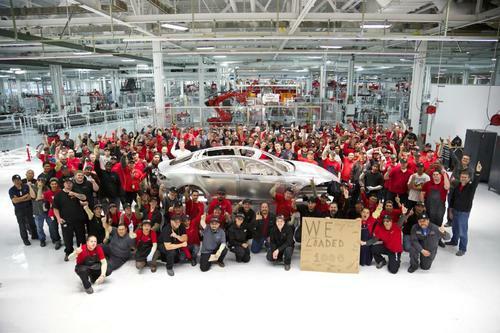 Tesla's original manufacturing plans was to produce 5,000 Model S's in 2012, and 20,000 in 2013. However certain delays happened and Tesla's manufacturing rate did not ramp up as quickly as originally forecasted. Tesla's management has said that they're working hard on reliability of their supply chain, and that the Model S production rate will increase to 400 vehicles/week by the end of the year. A 400/week production level means approximately 20,000 cars per year. The letter to reservation holders covered the 60 kilowatt-hour model, the 40 kilowatt-hour model, cars with the standard (coil) suspension, and cars with the 2013 Red multi-coat paint. The 60 kilowatt-hour models will begin manufacturing in January 2013, with deliveries beginning in January or February. The 40 kilowatt-hour models will begin manufacturing in March 2013, with deliveries beginning in March/April. The 60 kilowatt-hour models were originally slated to begin production in November 2012, the 40 kilowatt-hour and Coil suspension models in January 2013, and the new Red exterior paint in March. Hence, the production dates for everything but the new Red paint is shifted back by 2 months. Another aspect of the delay is that Tesla has not received EPA certification of the 60 kilowatt-hour Model S. Tesla's letter says this will be announced soon. This delay is affecting some who haven't finalized their Model S order yet because Tesla hasn't released final specs of either the 60 kilowatt-hour or 40 kilowatt-hour models. Last week Tesla announced a Model S price increase of $2500, that will not affect those who finalize their orders by December 31, 2012. Some commenters on teslamotorsclub.com say they're unwilling to finalize their order before seeing final specs or taking a test drive. At this rate the final specs for the 40 kilowatt-hour model won't be released until 2013 which is after the December 31 deadline, so those sitting on the fence will have to either pony up an extra $2500 for the privilege of waiting for the specs, or go ahead and finalize their order on blind faith. The delay of 60- and 40-kilowatt-hour models is to be expected because of the other delays, and the lessened 2012 Model S production target. The original target of 5000 Model S's in 2012 has been downgraded by Tesla's management to the range of 2,500-3,500 Model S's in 2012. While the delay is disappointing to the Model S reservation holders, in the bigger scheme of things it is more like a road bump or growing pain. Tesla still maintains they will manufacture 20,000 Model S's in 2013 and by the end of the year Tesla should have sold/delivered more Model S's than the entire run of Tesla Roadsters. I heard through the grapevine that Tesla expected people to flock to the base model and calculated their stocks accordingly. They got swamped on the higher-end version and need more base series inverters... to be confirmed.